Jim Brown was a running back for the Cleveland Browns for nine seasons, during which he would set numerous records, would win countless awards, and eventually would be regarded as one of the greatest football players of all time. Throughout his career, Brown won three NFL MVP awards and a NFL championship. Due to his Hall of Fame career, he will forever remain one of the NFL’s greatest players and a player that fans will always adore. His popularity among fans has made his rookie card extremely popular with collectors. The 1958 Topps Jim Brown rookie card is one of the most desired cards on the market and presents a potential profit to investors. Focus, centering and chipping on the red borders on the card's back make it very condition sensitive. Only about a half dozen PSA 9s have been passed out through the years and fewer than 200 8s. In 2010, an exceptionally strong PSA 9 copy sold at auction for over $27,000. High quality PSA 8 examples sell for around $2,000. SGC has also graded many Brown rookie cards. Lower grade examples, however, like those graded at PSA 5 and below, usually sell for less than $300. 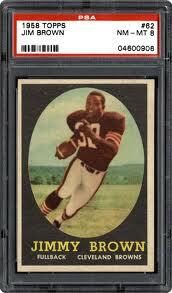 With these extreme ranges in price, you are probably wondering if a 1958 Topps Jim Brown is a good investment. The answer is yes. As one of the best and most popular NFL players of all time, Brown’s cards will always demand high prices. The constant desire for his cards make these cards a very stable investment. As is the case with the majority of vintage football cards, this card will appreciate significantly in value over time. However, large profits can also be made in shorter periods of time. In 2005, an example of this card graded at PSA 8 sold at auction for just over $1,000. In 2012, however, a different card with the same grade sold for $2,500. In seven short years, the card more than doubled in value. As a popular, desirable trading card the 1958 Topps Jim Brown rookie card is a very strong investment; one that will demand stable prices and can increase in value very quickly.